If It's Too Loud...: Barrence Whitfield & The Savages - "Let's Go to Mars"
Barrence Whitfield & The Savages - "Let's Go to Mars"
Titan is the largest moon orbiting Saturn, a planet which astrologically symbolizes pain, struggle and hard knocks on the human path to wholeness and liberation among many other things. Soul Flowers of Titan is a collection of songs representing our own cosmology, struggles & influences. People shooting guns, separating, coming home (someday), in love, running around, leaving this earth, going crazy, drinking coffee, and thinking about Sun Ra. Titan’s a forbidding, poisonous place with mountains, rivers and oceans of methane and ammonia, cloaked in a dense shroud of gases. The kinds of flowers that would grow there would be the hardy beasts that survived to make this strange bouquet. You can listen to "Let's Go to Mars" below. 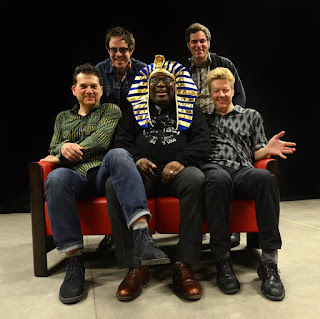 Barrence Whitfield's new album, Soul Flowers of Titan, will be available March 2 on Bloodshot Records. For more on Barrence Whitfield & The Savages, check out their website.